Had always found this story intriguing since the day I first read about it. There was also a movie made in 2001 about it and at the end there was a mundane explanation to the beast. I watched that movie but I found out only after 2-3 years that it was based on true events... it has always intrigued me as well. Wow, nice vintage video of my hometown well before I was born. I had never seen it before. Very clear video, and I've shared on a facebook page about memories from the town and its surroundings maybe someone recognizes somebody or was a kid in that video. P.S. Hibernians were already winning premiership trophies back then who knows where Birkirkara FC were then ? so what kind of animal was that? Did they ever manage to solve the case? 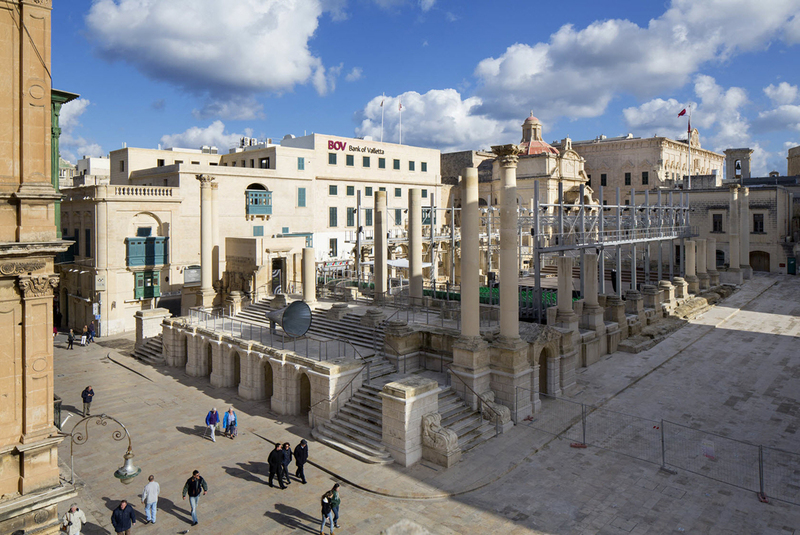 As anyone from Malta knows, near the main entrance in Valletta there once stood the splendid Royal Opera House. It was first built in 1866, destroyed by fire in 1873, reconstructed and completed in 1877. 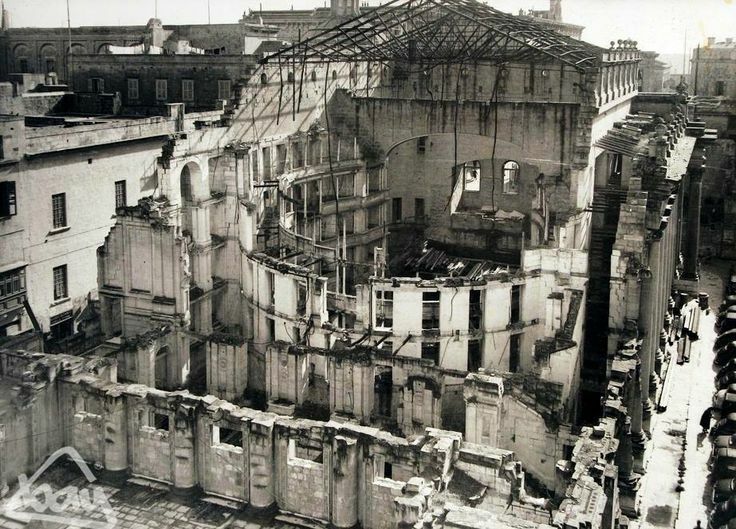 On 7 April 1942, unfortunately it was destroyed by Luftwaffe bombs during a night air raid and was reduced to this state. after knocking down all the remaining standing structure to remove the danger, this sore sight was left like that for nearly 70 years, until some idiot had the streak of genius and decided to turn it into an open air theater and made this hideous thing. I don't know if that season ever finished due to Italian talent involved, although Italy only joined the Axis in 1940.
those ads... amazing... the opel... and what about the four digit tel nrs ? They look like from another world, everything hand painted, no touch from the digital era. Although nearly 200 years of British rule, the Italian influence in culture is very visible - one can understand the dilemma of the many locals who were of heavy Italian influence when Italy declared war on the Allies. Once I have a moment, I'll try to upload some other adverts - there is one for Radio Marelli radios the size of a chest, Pirelli tyres and there are some local companies which are still around such as Thomas C Smith & C.Camilleri & Sons Ltd (the confectioners). Too bad we had many cowboys deciding the fate of the country since after WWII, including the Brits who were still running the show. Although we were the most bombarded place during the war we missed direct Marshall Aid money as a result of being part of the Empire and therefore the US gave the money to Britain but we received a trickle. That video has been a hit on that FB page - there were many old people who were nostalgic and recognized some people in it or were there themselves. There are some whom I even know myself but didn't recognize. Also the street in that film where that priest used to live, seems to be around the corner from where I used to live when young. Bayernbazi wrote: They look like from another world, everything hand painted, no touch from the digital era. Although nearly 200 years of British rule, the Italian influence in culture is very visible - one can understand the dilemma of the many locals who were of heavy Italian influence when Italy declared war on the Allies. yesterday there was a very interesting prog on tvm2 about two Italian anti fascist. Umberto Calosso and a certain Donati. The feature prog mentioned the Maltese who sympathized with Italy (and I don't blame them the Brits eradicated our Latin heritage) Even if you look at our diet... pastries, tea, butter, ... Ours should be a Med diet... They also mentioned the language influence etc, I will try to upload it just for these Maltese who are interested in our history. Really interesting period. So we had the Italian anti-fascists taking refuge in Malta and the pro fascists/italy Maltese moving away from Malta, some due to imposed exile in Africa while others escaping to Italy. Some of whom ended victims of this whole dilemma most notably the case of the 28 year old Carmelo Borg Pisani, sentenced to death for treason and still buried in Malta's prison after he allegedly returned to Malta in secret with the help of the Italians with the intention of spying. In the meantime he is still considered a patriot in Italy where there used to be streets named after him ! for me Carmelo Borg Pisani is a hero. He was killed without a trial. And he wanted Malta to be closer to italy and not England. And I respect that. Bayernbazi wrote: Really interesting period. So we had the Italian anti-fascists taking refuge in Malta and the pro fascists/italy Maltese moving away from Malta, some due to imposed exile in Africa while others escaping to Italy. Some of whom ended victims of this whole dilemma most notably the case of the 28 year old Carmelo Borg Pisani, sentenced to death for treason and still buried in Malta's prison after he allegedly returned to Malta in secret with the help of the Italians with the intention of spying. In the meantime he is still considered a patriot in Italy where there used to be streets named after him ! I saw this story on Voyager Rai2.